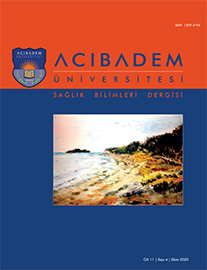 Acibadem University Health Sciences Journal is the peer-reviewed open-access official scientific publication of Acibadem University, which was founded in 2008. The objective of the journal is to publish clinical and experimental research articles, invited reviews, case reports, editorials, letters to the editor, and comments in all fields of health sciences. The journal, which is issued quarterly in January, April, July and October, is only available online. The journal is written in Turkish and English and so are the summaries. The language of the journal is both Turkish and English. Acibadem University Health Sciences Journal based on unbiased and independent double-blinded peer reviewed principles. Papers under review for publication elsewhere should not be submitted to our journal. Responsibility of the scientific content of the article belongs to the author. Authors are not paid royalty. Article presentations to journal, correspondences, forwarding articles to the judges, requesting corrections (if any) from the authors and finally notifying the authors about the approval or rejection of the articles after they are reviewed by the editor, are among the processes which are carried-out online. Another fundamental principle of the journal is the fast evaluation of the articles as part of the code of ethics and timely publication. The Editorial Board of the Acibadem University Health Sciences Journal and the Publisher strictly adheres to the principles of the International Council of Medical Journal Editors (ICMJE), the World Association of Medical Editors (WAME), the Council of Science Editors (CSE), the Committee on Publication Ethics (COPE), the US National Library of Medicine (NLM), the World Medical Association (WMA), the US Office of Research Integrity (ORI), the European Association of Science Editors (EASE), and the International Society of Managing and Technical Editors (ISMTE). Acibadem University Health Sciences Journal is an open access journal, and involved in Budapest Open Access Initiative (BOAI) (http://www.budapestopenaccessinitiative.org/list_signatures). The term open access gives the right of readers to read, download, distribute, copy, print, search, or link to the full texts of the articles free of charge. According to the open access policy, peer-reviewed research literature is freely available on the public internet, permitting any users to read, download, copy, distribute, print, search, or link to the full texts of these articles, crawl them for indexing, pass them as data to software, or use them for any other lawful purpose, without financial, legal, or technical barriers other than those inseparable from gaining access to the internet itself. The author(s) and copyright holder(s) grant(s) to all users a free access to articles. Acibadem University Health Sciences Journal, is being indexed by TUBITAK*/ULAKBIM** Medical Database (Turkish Medicine Index) and Türkiye Atıf Dizini***. Click here for Acibadem University Health Sciences Journal’s writing rules.